When Shannon Travis was stationed at Balad Air Base in Iraq for 14 months, one of her jobs was refueling helicopters. ­The shifts were long, and when there were no helicopters, she and her team had hours of downtime. ­They whittled away the time playing cards, watching TV and just hanging out. Travis’ stint in Iraq ended in 2008, and after a few major life changes, she is now a staff sergeant in the Army Reserve and a senior at McDaniel College, a private four-year college in rural Maryland. Her husband, Patrick Robbins, who is also a veteran and whom she met while stationed in Germany, graduated from McDaniel in 2015. 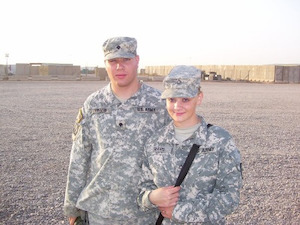 When Travis and Robbins returned to the United States in 2010, they joined the Army Reserve and started taking classes at Carroll Community College in Maryland. Travis dreamed of becoming a Foreign Service officer, so she set her sights on transferring to American, George Washington or Georgetown universities, with their renowned international relations programs. She was also curious about McDaniel, which was just up the road in Westminster. “I heard a lot of good things from the community college about McDaniel, so I went to the political science department and I talked to the academic dean,” Travis says. Soon, she was sold on the school’s welcoming environment and is now caught up in what she calls the “political science bubble” on campus. Her studies were interrupted in 2014 when she was called overseas to serve as a force protector in Afghanistan, an experience that offered very different opportunities from her time in Balad. She acted as a liaison with local communities, even learning to speak some Dari, the local language. “It’s taking me longer to get my degree, but I think Afghanistan also brought a lot of experience,” she says. ­The original GI Bill, or the Servicemen’s Readjustment Act of 1944, as it is formally known, transformed American life. Millions of soldiers returning from World War II were given access to low-cost mortgages to buy homes, loans to start businesses, and cash payments to cover tuition and living expenses while attending university, high school or vocational school. Historians credit the GI Bill with helping to create the “Greatest Generation,” sending millions to college who otherwise would not be able to afford it. That surge in college and degree attainment helped create what became the modern middle class. Many colleges doubled in size as a result. Elite institutions that were formerly the sole province of the wealthy started to open their doors to a more economically diverse student body. At the turn of the century, approximately six decades after the original GI Bill was signed, benefits had not kept pace with the rising costs of going to college. In 1985, the GI Bill was updated, becoming the Montgomery GI Bill. Under that guise, the bill offered stipends for up to 36 months to individuals who had completed active-duty service of three years or more. As of 2007, the maximum amount awarded was a little over $1,000 a month. Taking note of the challenges that veterans and service members face in their efforts to get an education or job training, Sen. Jim Webb, D-Va., authored the Post-9/11 Veterans Educational Assistance Act, which would replace key elements of the Montgomery GI Bill, with the explicit goal of replicating the benefits available to veterans after World War II. Under Webb’s new vision for the GI Bill, which he proposed on his first day in the Senate in 2007, veterans, service members and their families would be able to access a much more comprehensive array of services. In addition to covering up to 100 percent of tuition and fees for public, in-state undergraduate tuition, the bill provides recipients with a housing allowance, $1,000 a year for books and supplies, and, for individuals living in remote areas, a one-time relocation allowance. If they choose to not make use of their benefits, members of the military can transfer their eligibility to family members. With the housing and book allowance, recipients can dedicate themselves full time to school. For veterans and service members who may have bought a home or are married with children, those additional benefits are a crucial element of their success. Gregory Wilson, a junior at McDaniel, can attest to the value of the housing allowance. He enlisted in the Army straight out of high school and was stationed in Hawaii and Afghanistan. Now he is 26 years old, attends school full time and plans to become a high school social studies teacher once he graduates. “I’m unemployed, so the GI Bill housing allowance is a very important part of my finances,” he says. Wilson owns his own home, and he says it would not be possible to finish his course of study on time if he also had to hold down a part-time job to cover the mortgage. After some wrangling in Congress, and an initial threat of veto from President George Bush, Webb’s bill passed in 2008. Overall, the bill has been a boon for veterans, active service members and military families. Between the program’s inception in 2009 and 2013, the Post-9/11 GI Bill had benefited 1 million active service members, veterans and military family members to the tune of more than $30 billion in tuition and other education-related payments, according to the Veteran Benefits Administration. While the Post-9/11 GI Bill has been transformative for many, the billions of dollars in funding have proved to be too tempting for some unscrupulous actors. Over the years, a number of for-profit colleges have cashed in on the Post-9/11 GI Bill, aggressively recruiting military service members and veterans. Some for-profits offered unaccredited degrees, leaving graduates with debt but no improved job prospects. Veterans are particularly attractive to for-profits because of a loophole in the 90/10 rule, which requires that institutions derive no more than 90 percent of their revenue from federal college aid. The GI Bill is exempt from that rule, allowing institutions to target veterans. The now-defunct Corinthian College, Inc. is one example of the sort of institution that targeted veterans. A Senate HELP Committee report found that Corinthian was one of the top recipients of Post-9/11 GI Bill funds, receiving $186 million from 2009 to 2013. Corinthian is the subject of an ongoing lawsuit from the California Attorney General’s office, which alleges that the company used misleading recruitment techniques, such as including the official seals of the branches of the U.S. military in its advertising materials for military members. After a series of investigations and a financial collapse when the U.S. Department of Education withheld federal funds, Corinthian finally closed its doors in April 2015. The fate of its last 16,000 students and the student loan debt that many now carry is still being resolved. Earlier this summer, an investigation from The Center for Investigative Reporting found that as many as 2,000 unaccredited institutions received $260 million of GI Bill funds since 2009. In mid-September, Sen. Richard Blumenthal, D-Conn., and Sen. Thom Tillis, R-N.C., introduced the Career-Ready Student Veterans Act of 2015, which would prevent Post-9/11 GI Bill funds from being used at unaccredited institutions.